Starting to get stuff ready for Bath Art Fair in less than a fortnight’s time now. 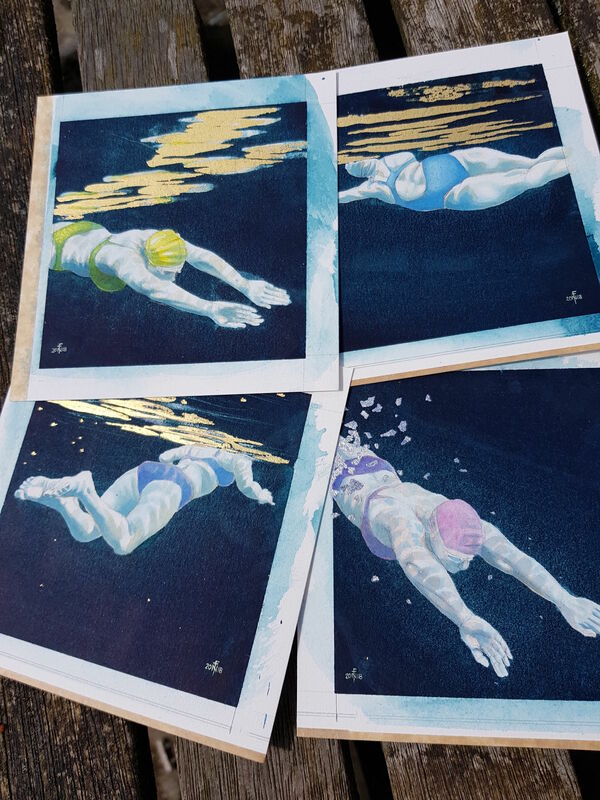 These are some more of my ‘mini swimmers’ series – they are only 4 inches square, in watercolour and (mostly) gold leaf. Fellow swimmers: they have some leaflets in the shop at Vobster Quay that will get you in on a two for one (usually £5 entry for one). I also have more leaflets – Clevedon Swimmers I’ll see if I can leave some in The Salthouse. This entry was posted in Exhibition stuff, Past Exhibitions, swimming and tagged Bath Art Fair, Exhibitions on April 29, 2018 by Nancy Farmer.